In this exciting DVD, Jackie Truty shows you how easy it is to design and produce fabulous jewelry with moldable silver clay. The binders burn out when fired, leaving you with a pure silver form. 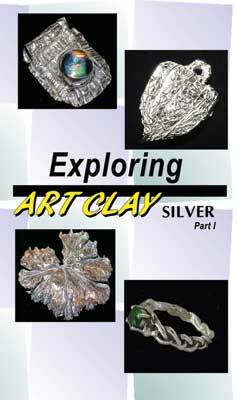 This incredible clay can be shaped into any form imaginable by rolling, sculpting, molding and stamping. You'll make four projects, and learn the methods for shaping, drying, and firing. You'll also see how to create a pendant using a center piece of dichroic glass. Lots of fun! Easy to learn. Want to watch right NOW? We offer VIDEO ON DEMAND. Save $10 and watch NOW! Click the button that shows ADD TO CART in FULL CAPS. This will take you to a second secure site for checkout. This will be an independent transaction and not added to your www.firelady.com shopping cart. Once you have completed your VIDEO ON DEMAND transaction, you'll need to manually come back to www.firelady.com to continue shopping here. A couple of extra clicks, but it allows you to watch the video right now and saves you the shipping as well! Happy Viewing!